1 of 1 Heat grill to medium-high. Combine 1 lb ground beef, 1 grated clove garlic, 2 tbsp jarred pesto, 1/4 tsp salt and 1/4 tsp black pepper. Form into 4 patties. Remove and discard gills from 4 medium portobello mushrooms. Brush with 1 tbsp extra-virgin olive oil and season with 1/4 tsp salt. 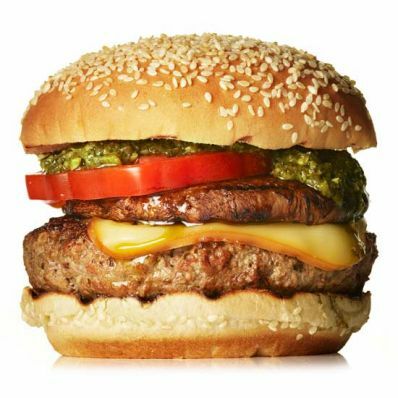 Grill burgers and mushrooms 4 to 5 minutes, flip and add 1 oz sliced smoked mozzarella to each burger. Grill another 4 to 5 minutes for medium-rare (135 degrees ). Stack mushrooms on top of cheeseburgers and place on bottom halves of 4 seeded buns. Add 1 slice tomato, 1 tbsp pesto and a bun top to each burger. Per Serving: 570 kcal cal., 10 g sat. fat, 31 g Fat, total, 35 g carb., 8 g sugar, 2 g fiber, 970 mg sodium, 31 g pro.